Rain showers early, then clear overnight. Low 53F. Winds WSW at 10 to 20 mph. Chance of rain 40%.. Rain showers early, then clear overnight. Low 53F. Winds WSW at 10 to 20 mph. Chance of rain 40%. Coastal Georgia Ayshia Baker is fouled on a shot against Voorhees College on Wednesday at Howard Coffin Gym. Coastal Georgia’s Brianna Gipson makes a move in the post against Voorhees College on Wednesday at Howard Coffin Gym. Coastal Georgia’s Solrun Gisladotti dribbles the ball up court against Voorhees College on Wednesday at Howard Coffin Gym. Coastal Georgia made enough mistakes to sink a lot of teams in the first half of Wednesday’s contest against Voorhees College. The Mariners also showed off why they’re a serious threat in The Sun Conference as they pushed past the feisty Tigers 75-68 at Howard Coffin Gym. Coastal (11-6, 5-3) got 62 points from its big three of Brianna Gipson, Solrun Gisladottir, and Ayshia Baker, each coming through in crucial situations to help the team avoid falling into the trap against a non-conference opponent. Gisladottir scored nine of her 20 points in the first quarter as Coastal ran out to an 11-2 lead, prompting the Voorhees bench to shout out which side of the court she was located on when running the court in transition. But after leading by as many as 12 in the first quarter, the Mariners lost some steam at the beginning of the second under a cascade of turnovers. Coastal produced more than half of its first-half turnover total in a minute and a half stretch that saw the team cough up seven possessions in a variety of ways. “I think that there were two things that kind of led to that spurt,” Hodge said. “I think, first of all, we weren’t ready to play, and that’s on me. I don’t want to say they didn’t take it seriously, but at the same time, it was kind of a trap game coming off Southeastern, a real emotional loss, and you come out here and you have to refocus. Voorhees also took advantage of some uncharacteristically poor free throw shooting by Coastal as it erased its deficit and went up 33-26 on the back of a 19-4 run, capped by 3-pointer with 2:34 remaining in the half. A 64 percent shooting team from the charity stripe on the season, the Mariners shot just 8-of-20 from the free throw line in the first half before regressing back to the mean with a 12-of-17 performance in the second half. “I think missing the free throws deflated us, and it added to their emotion,” Hodge said. “In the second half… that’s how you put teams away is when you get to the line and you keep them off the line. The Mariners drew to within two before going into the locker room and came out firing in the third quarter led by Baker, who scored six points, pulled down three rebounds, and blocked two shots over the first six minutes of the second half as her team went up 49-41. Baker finished with 15 points and nine rebounds. Voorhees made another charge in the fourth, tying it at 53-53 on a 3-pointer less than a minute into the final period, but Gipson had found a rhythm and couldn’t be stopped. 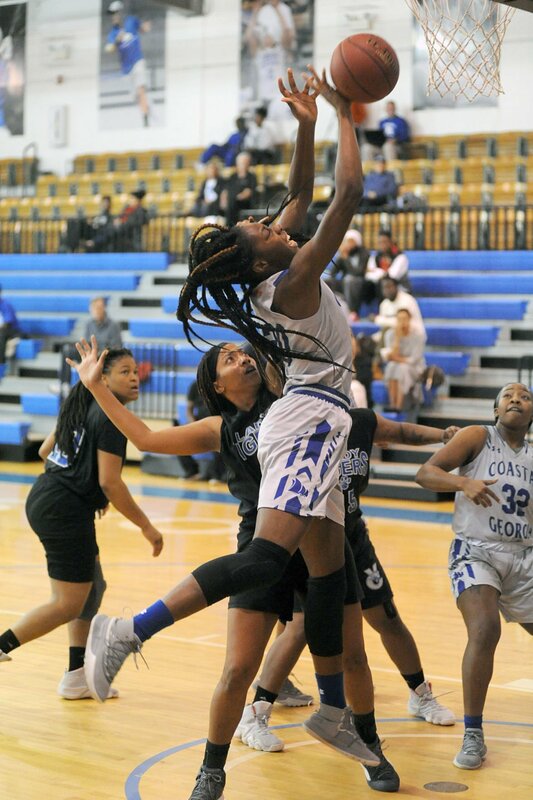 Gipson scored 13 points in the third quarter and added 10 more in the fourth as she tallied a game-high 27 points and helped Coastal drive a stake into Voorhees, despite one more last-minute push that saw it score eight straight over the final two minutes. The Coastal Georgia women return to action Saturday when it travels to Thomasville for a Sun Conference contest against Thomas University. Tipoff is set for 2 p.m.